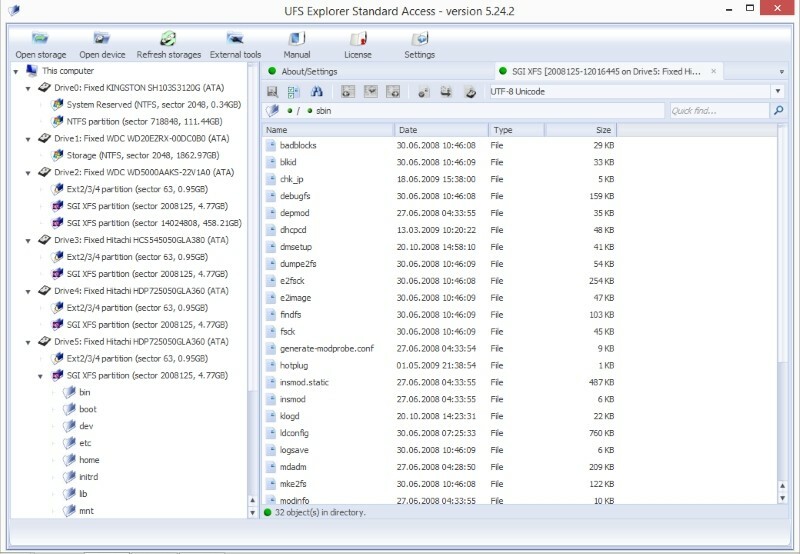 UFS Explorer Standard Access is a software created exclusively for cases when the access to undamaged data on a physical storage, disk images or virtual disks of virtual machines is difficult or impossible. The software enables fast and easy access to blocked data. With the support of a wide variety of operating systems, UFS Explorer Standard Access allows you to open an inaccessible file from Windows, Apple macOS, Linux and FreeBSD working on a device, that is running on Windows OS. The software supports various file systems - NTFS, FAT/FAT32, exFAT, ReFS, ReFS2 (Windows), HFS+ and the brand new APFS (Apple macOS); Ext2, Ext3, Ext4, Reiser, XFS, JFS (JFS2) (Linux) and UFS/UFS2 (FreeBSD), as well as Solaris/Mac big-endian UFS/UFS2, Adaptec UFS, Sun ZFS, Btrfs, Novell NWFS, Novell Storage Services, DTFS, HTFS, VxFS, AIX JFS1/J2FS; VMware VMFS (3, 5, 6). UFS Explorer Standard Access will help you to get access to data located on an external storage formatted with any of these supported file systems. This program also provides direct access to files on virtual disks of virtual machines and any their copies allowing you to eliminate virtual machine start and configuration. Additionally, with RAID Access Plugin - RAID Builder, you can access data on any complex RAID system built with the plug-in. Working as a â€œguideâ€ from one file system to another UFS Explorer Standard Access in no way changes the information on the storage. The software operates in a read-only mode ensuring 100% safety of your data. UFS Explorer Standard Access serves for cases when neither a file system is corrupted nor recovery of data is required. 2018-04-23 5.25 Added support of several new camera RAW formats (including new Canon CR3).